These AC Variable Speed drives are for Washdown Duty and are available for Immediate Shipment. The NEESON Micro Series line of compact inverters offer “Big drive” features for adapting standard or premium efficient three-phase to adjustable speed operation. They utilize the latest technology in software and power conversion circuitry. They are easy to program and read-out in plain English, eliminating the frustration and time involved in trying to translate symbols. NEMA 4/12 (IP65/IP54) rugged steel enclosures are offered in either a Food-Safe Epoxy Finish or in 300-Series Stainless Steel. Some higher HP inverters are only offered as NEMA 12, having an external cooling fan. Built-in thermal overload protection reduces additional costs. Heavy duty wiring terminals and accessible conduit openings reduce installation time. LEESON 174935.00 WASHGUARD NEMA 4/12 (IP65/IP54) 3PH 200V .5HP 2.2A 9 lbs. LEESON 174936.00 WASHGUARD NEMA 4/12 (IP65/IP54) 3PH 200V 1HP 4A 10 lbs. LEESON 174482.00 WASHGUARD NEMA 4/12 (IP65/IP54) 3PH 200V 1.5HP 5.2A 10 lbs. LEESON 174937.00 WASHGUARD NEMA 4/12 (IP65/IP54) 3PH 200V 2HP 6.8A 12 lbs. LEESON 174938.00 WASHGUARD NEMA 4/12 (IP65/IP54) 3PH 200V 3HP 9.6A 12 lbs. LEESON 174730.00 WASHGUARD NEMA 4/12 (IP65/IP54) 3PH 200V 5HP 15.2A 12 lbs. LEESON 174734.00 WASHGUARD NEMA 4/12 (IP65/IP54) 3PH 200V 7.5HP 22.0A 35 lbs. LEESON 174737.00 WASHGUARD NEMA 4/12 (IP65/IP54) 3PH 200V 10HP 28A 35 lbs. LEESON 174740.00 WASHGUARD NEMA 4/12 (IP65/IP54) 3PH 200V 15HP 43A 40 lbs. LEESON 174743.00 WASHGUARD NEMA 4/12 (IP65/IP54) 3PH 200V 20HP 54A 45 lbs. LEESON 174595.00 WASHGUARD NEMA 4/12 (IP65/IP54) 3PH 200V 25HP 68A 55 lbs. LEESON 174596.00 WASHGUARD NEMA 4/12 (IP65/IP54) 3PH 200V 30HP 80A 55 lbs. LEESON 174939.00 WASHGUARD NEMA 4/12 (IP65/IP54) 3PH 400V 1HP 2A 10 lbs. LEESON 174940.00 WASHGUARD NEMA 4/12 (IP65/IP54) 3PH 400V 2HP 3.4A 12 lbs. LEESON 174941.00 WASHGUARD NEMA 4/12 (IP65/IP54) 3PH 400V 3HP 4.8A 12 lbs. LEESON 174942.00 WASHGUARD NEMA 4/12 (IP65/IP54) 3PH 400V 5HP 7.6A 12 lbs. LEESON 174548.00 WASHGUARD NEMA 4/12 (IP65/IP54) 3PH 400V 7.5HP 11A 12 lbs. LEESON 174554.00 WASHGUARD NEMA 4/12 (IP65/IP54) 3PH 400V 10HP 14A 15 lbs. LEESON 174749.00 WASHGUARD NEMA 4/12 (IP65/IP54) 3PH 400V 15HP 21A 35 lbs. LEESON 174752.00 WASHGUARD NEMA 4/12 (IP65/IP54) 3PH 400V 20HP 27A 35 lbs. LEESON 174755.00 WASHGUARD NEMA 4/12 (IP65/IP54) 3PH 400V 25HP 34A 45 lbs. LEESON 174757.00 WASHGUARD NEMA 4/12 (IP65/IP54) 3PH 400V 30HP 40A 53 lbs. LEESON 174513.00 WASHGUARD NEMA 4/12 (IP65/IP54) 3PH 400V 40HP 52A 55 lbs. LEESON 174511.00 WASHGUARD NEMA 4/12 (IP65/IP54) 3PH 400V 50HP 65A 75 lbs. LEESON 174574.00 WASHGUARD NEMA 4/12 (IP65/IP54) 3PH 400V 60HP 77A 100 lbs. LEESON 174581.00 WASHGUARD NEMA 4/12 (IP65/IP54) 3PH 400V 75HP 96A 250 lbs. LEESON 174583.00 WASHGUARD NEMA 4/12 (IP65/IP54) 3PH 400V 100HP 124A 365 lbs. LEESON 174585.00 WASHGUARD NEMA 4/12 (IP65/IP54) 3PH 400V 125HP 156A 365 lbs. LEESON 174943.00 WASHGUARD NEMA 4/12 (IP65/IP54) 3PH 480V 1HP 1.6A 10 lbs. LEESON 174944.00 WASHGUARD NEMA 4/12 (IP65/IP54) 3PH 480V 2HP 2.7A 15 lbs. LEESON 174945.00 WASHGUARD NEMA 4/12 (IP65/IP54) 3PH 480V 3HP 3.9A 15 lbs. LEESON 174946.00 WASHGUARD NEMA 4/12 (IP65/IP54) 3PH 480V 5HP 6.1A 15 lbs. LEESON 174549.00 WASHGUARD NEMA 4/12 (IP65/IP54) 3PH 480V 7.5HP 9A 15 lbs. LEESON 174556.00 WASHGUARD NEMA 4/12 (IP65/IP54) 3PH 480V 10HP 11A 18 lbs. LEESON 174763.00 WASHGUARD NEMA 4/12 (IP65/IP54) 3PH 480V 15HP 17A 40 lbs. LEESON 174766.00 WASHGUARD NEMA 4/12 (IP65/IP54) 3PH 480V 20HP 22A 40 lbs. LEESON 174769.00 WASHGUARD NEMA 4/12 (IP65/IP54) 3PH 480V 25HP 27A 42 lbs. LEESON 174597.00 WASHGUARD NEMA 4/12 (IP65/IP54) 3PH 480V 30HP 32A 54 lbs. LEESON 174512.00 WASHGUARD NEMA 4/12 (IP65/IP54) 3PH 480V 40HP 41A 54 lbs. LEESON 174510.00 WASHGUARD NEMA 4/12 (IP65/IP54) 3PH 480V 50HP 52A 75 lbs. LEESON 174575.00 WASHGUARD NEMA 4/12 (IP65/IP54) 3PH 480V 60HP 62A 100 lbs. LEESON 174527.00 WASHGUARD NEMA 4X (IP65) 3PH 200V .5HP 2.2A 8 lbs. LEESON 174528.00 WASHGUARD NEMA 4X (IP65) 3PH 200V 1HP 4A 8 lbs. LEESON 174529.00 WASHGUARD NEMA 4X (IP65) 3PH 200V 1.5HP 5.2A 8 lbs. LEESON 174530.00 WASHGUARD NEMA 4X (IP65) 3PH 200V 2HP 6.8A 10 lbs. LEESON 174531.00 WASHGUARD NEMA 4X (IP65) 3PH 200V 3HP 9.6A 12 lbs. LEESON 174732.00 WASHGUARD NEMA 4X (IP65) 3PH 200V 5HP 15.2A 12 lbs. LEESON 174735.00 WASHGUARD NEMA 4X (IP65) 3PH 200V 7.5HP 22A 28 lbs. LEESON 174738.00 WASHGUARD NEMA 4X (IP65) 3PH 200V 10HP 28A 35 lbs. LEESON 174741.00 WASHGUARD NEMA 4X (IP65) 3PH 200V 15HP 43A 40 lbs. LEESON 174532.00 WASHGUARD NEMA 4X (IP65) 3PH 400V 1HP 2A 8 lbs. LEESON 174533.00 WASHGUARD NEMA 4X (IP65) 3PH 400V 2HP 3.4A 10 lbs. LEESON 174534.00 WASHGUARD NEMA 4X (IP65) 3PH 400V 3HP 7.8A 10 lbs. LEESON 174535.00 WASHGUARD NEMA 4X (IP65) 3PH 400V 5HP 7.6A 12 lbs. LEESON 174745.00 WASHGUARD NEMA 4X (IP65) 3PH 400V 7.5HP 11A 12 lbs. LEESON 174747.00 WASHGUARD NEMA 4X (IP65) 3PH 400V 10HP 14A 12 lbs. LEESON 174750.00 WASHGUARD NEMA 4X (IP65) 3PH 400V 15HP 21A 32 lbs. LEESON 174753.00 WASHGUARD NEMA 4X (IP65) 3PH 400V 20HP 27A 36 lbs. LEESON 174536.00 WASHGUARD NEMA 4X (IP65) 3PH 480V 1HP 1.6A 8 lbs. LEESON 174537.00 WASHGUARD NEMA 4X (IP65) 3PH 480V 2HP 2.7A 10 lbs. LEESON 174538.00 WASHGUARD NEMA 4X (IP65) 3PH 480V 3HP 3.9A 10 lbs. LEESON 174539.00 WASHGUARD NEMA 4X (IP65) 3PH 480V 5HP 6.1A 10 lbs. LEESON 174759.00 WASHGUARD NEMA 4X (IP65) 3PH 480V 7.5HP 9A 15 lbs. LEESON 174761.00 WASHGUARD NEMA 4X (IP65) 3PH 480V 10HP 11A 18 lbs. LEESON 174764.00 WASHGUARD NEMA 4X (IP65) 3PH 480V 15HP 17A 38 lbs. LEESON 174767.00 WASHGUARD NEMA 4X (IP65) 3PH 480V 20HP 22A 40 lbs. LEESON 174519.00 NEMA 4X (IP65) STAINLESS STEEL 1PH,3PH 230V .25HP 1.4A 8 lbs. LEESON 174520.00 NEMA 4X (IP65) STAINLESS STEEL 1PH,3PH 230V .5HP 2.2A 8 lbs. LEESON 174521.00 NEMA 4X (IP65) STAINLESS STEEL 1PH,3PH 230V 1HP 4A 11 lbs. LEESON 174517.00 NEMA 4X (IP65) STAINLESS STEEL 1PH,3PH 230V 1.5HP 5.2A 12 lbs. LEESON 174525.00 NEMA 4X (IP65) STAINLESS STEEL 1PH,3PH 230V 2HP 6.8A 12 lbs. LEESON 174526.00 NEMA 4X (IP65) STAINLESS STEEL 1PH,3PH 230V 3HP 9.6A 12 lbs. LEESON 174996.00 NEMA 4 (IP65) EPOXY COATED 1PH,3PH 230V .25HP 1.4A 8 lbs. LEESON 174998.00 NEMA 4 (IP65) EPOXY COATED 1PH,3PH 230V .5HP 2.2A 8 lbs. LEESON 174999.00 NEMA 4 (IP65) EPOXY COATED 1PH,3PH 230V 1HP 4A 11 lbs. LEESON 174515.00 NEMA 4 (IP65) EPOXY COATED 1PH,3PH 230V 1.5HP 5.2A 11 lbs. LEESON 174475.00 NEMA 4 (IP65) EPOXY COATED 1PH,3PH 230V 2HP 6.8A 11 lbs. LEESON 174729.00 NEMA 4 (IP65) EPOXY COATED 1PH,3PH 230V 3HP 9.6A 12 lbs. 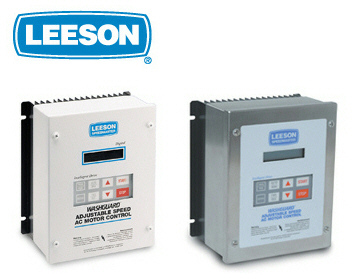 Purchase your LEESON Micro Series NEMA 4/12 Variable Speed AC Drives today!